Already have a tankless water heater? In need of service or repair? Our experienced technicians would be happy to help. Flushing/Descaling – Tankless water heaters are generally pretty low maintenance. However, most of the major brands recommend flushing or descaling the units from time to time to keep them operating efficiently. Flushing the units helps prevent mineral buildup inside the unit, which can cause the burner to work at a higher temperature to heat the water. The frequency with which this service should be performed is typically based on the hardness of the water it’s used to heat, but generally every couple of years is sufficient. General Service and Repairs– Performance issues are not incredibly common with tankless water heaters, but as with any type of technology, they can happen. It is recommended that only experienced technicians service them. 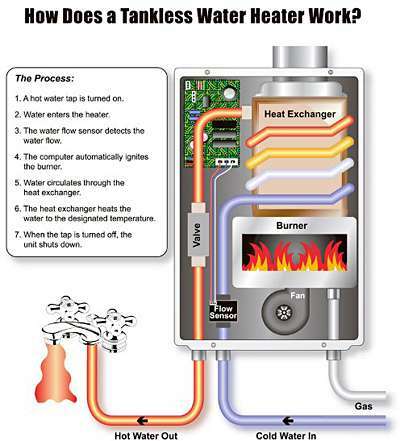 If you find that your tankless water heater is not heating or is having another type of problem, give us a call. We service most major brands, including Rinnai and Noritz. Be sure to check our Promotions page for a $250 instant rebate on new tankless installation.